This category is for topics relating to performing and announcing science and scientific research on the Internet. Discussions on researcher online presence, guidelines for best practices and my experiences can all be found here. How can socks facilitate scientific outreach? OK, it seems odd, at least on the surface. How can socks help science generally, and science outreach specifically? I asked myself the same question a few months ago when I found an email lurking in my inbox, hidden since just before my maternity leave started. It seems a sock company called Sock It To Me socks featured a different Cool Girl each month, and they wished to feature me. I had a lot of questions. Was this for real? Was it an appropriate platform to be talking about myself, and about what I do? Would it seem as if I was trading my online work persona for socks? Well, the other Cool Girls’ profiles seemed eclectic and interesting: dancers, astrophysicists, mathematicians and many others. So, not bad company to be in, and it was a genuine request. And, before you ask, I will be getting two pairs of socks for my efforts – ah, temptation. But ultimately, I need to take care of my work/public online persona, and I had to decide whether this was a good addition. But then I realized I could talk about ontologies to people who may have never even heard of bioinformatics and, for me, that was too exciting an opportunity to miss. True, it was limited to 600 words, and a writer used the information I gave her to write the final piece, but I think it was all worth it. She did a great job, and within the confines of the article format, I’m happy about how my field of research is portrayed. I really feel strongly about science outreach, and I do think that novel methods of information dissemination shouldn’t necessarily be ruled out. So, here it is: Ms Cool Girl of the Month, July 2011. What do you think? Did I benefit science or just myself (well, maybe not just myself – I namechecked my high school biology teacher, and mentioned Cameron too)? Author Allyson ListerPosted on July 4, 2011 July 7, 2011 Categories Housekeeping & Self References, Outreach, Science OnlineTags sock it to meLeave a comment on How can socks facilitate scientific outreach? I had a great time in Sweden this past summer, at ISMB 2009 (ISMB/ECCB 2009 FriendFeed room). I listened to a lot of interesting talks, reconnected with old friends and met new ones. I went to an ice bar, explored a 17th-century ship that had been dragged from the bottom of the sea, and visited the building where the Nobel Prizes are handed out. While there, many of us took notes and provided commentary through live blogging either on our own blogs or via FriendFeed and Twitter. The ISCB were very helpful, having announced and advertised the live blogging possibilities prior to the event. Once at the conference, they provided internet access, and even provided extension cords where necessary so that we could continue blogging on mains power. Those of us who spent a large proportion of our time live blogging were asked to write a paper about our experiences. This quickly became two papers, as there were two clear subjects on our minds: firstly, how the live blogging went in the context of ISMB 2009 specifically; and secondly, how our experiences (and that of the organisers) might form the basis of a set of guidelines to conference organisers trying to create live blogging policies. The first paper became the conference report, a Message from ISCB published today in PLoS Computational Biology. This was published in conjunction with the second paper, a Perspective published jointly today in PLoS Computational Biology, that aims to help organisers create policies of their own. Particularly, it provides “top ten”(-ish) lists for organisers, bloggers and presenters. If you have any questions or comments about either of these articles, please comment on the PLoS articles themselves, so there can be a record of the discussion. What happens when an ontologist or two gets frustrated at the long-scale publication process that is the norm when publishing scientific books? You get Ontogenesis: a quick-turnaround, low-maintenance solution using WordPress blog software. Next, a bunch of other ontologists are invited to a two-day, intensive writing and peer-reviewing workshop and the initial content is created. Result? Well, my favourite result was Kendall Clark tweeting this: “#Ontogenesis is awesome: http://ontogenesis.knowledgeblog.org/“. Phil Lord had the idea, and together with Robert Stevens and others organised the 2-day Ontogenesis workshop that occurred last week, 21-22 January 2010. Why look around for an alternative to traditional publishing methods? When writing a book, accepting the invitation might take 5 minutes, but getting around to doing it can take 6 months or more. You may only spend a couple of days writing the article, but then need to wait months for reviews (and do reviews for the other authors’ articles). Then there is the formatting and camera-ready copy. Then you may wait many months for proofs and then only get a few days to make corrections. Then, you can wait year or so for actual publication, by which time it is possibly out of date. Not ideal, but still necessary for some forms of publishing. stable, permanent URLs: Permanent URLs for articles and peer reviews. DOIs have been discussed as well, and are being considered. automatic linking of peer reviews and related online articles. The WordPress software automatically adds trackbacks, pingbacks, etc. as comments on the relevant articles, making it easy for interested readers to visit the peer reviews written for that article. completely open review system. Unlike many peer-review systems in use today, the reviewer (publicly) publishes his/her article in Ontogenesis. less work and quick turnaround time for the editors, reviewers, and authors. Once you have written your article (in whatever format you like, other than a few broad suggestions about licensing and intention), you publish it as “Uncategorised” in the system, and then once reviewers have agreed to look at it, move it to “Under Review”. Once reviews are complete, and the editors have checked everything, it is moved to “Reviewed”. Pretty simple. But is Ontogenesis a blog? Not really. Is it a book? Not in the traditional sense. While it seems to be correct to call it a blog, how the blog software is being used isn’t the way many people use it. And, though Duncan has called it “blogging a book”, this isn’t quite right either: while content, once completed, will not be changed, new content will be continually added. Phil discussed this point in his introduction to the workshop. He stated that wikis are best suited for certain styles of articles, but not for this sort of infrequently-updated information. Further, in wikis in general, crediting is poor. Google Knol is a nice idea, but not many people are using it. If it’s just a plain website, then there is no real way to have (and to show, more importantly), peer review. To me, and to the general agreement of the people at the workshop, Ontogenesis can be viewed as a title/proper noun, in the same way as Nature is a title of a journal. Ontogenesis is the first of a class of websites called Knowledge Blogs. It is has more in common with the high-quality, article-style blogging of ScienceBlogs or Research Blogging than it does with the short, informal blogging style that is used by most bloggers. Each article stands on its own, is of a high quality, and describes a topic of interest to both ontologists and novices in the ontology world. Each article is aimed at a general life science readership, ensuring accessibility of knowledge and broad appeal. I was lucky enough to be invited to the workshop last week, and had a great time. After an introductory set of presentations, we all got started writing our articles. The idea was that, once written, each article would be peer reviewed by at least 2 others at the workshop. Once the peer reviews were complete, the article would be re-categorised from “Under Review” to “Review”. As Phil said in a recent blog post, we wrote a large number of articles, though the number that have gone through the full review process was not as high. We expect that over the next few days, the number of completed articles will rise. My article on Semantic Integration in the Life Sciences was the first to come out of peer review. Thanks are very much due to Frank Gibson, Michel Dumontier, and David Shotton for their peer reviewing and constructive criticism: it is a much better article for their input. I also reviewed a couple of articles (1,2) by Helen Parkinson and James Malone, which should be moved to a Reviewed status soon. Enable the plugin for autogenerating related articles to improve cross-links. The Table of Contents has been started, but different “pathways” for different intended readerships to help guide them through the articles would be helpful. Reviewers should be able to change Categories in any article so they can mark when it is Under Review, rather than waiting for the Authors to do this. The article-specific Table of Contents are very helpful, but it might be better to move it to different location in the post (e.g. the top rather than the bottom). Have a way to mark yourself as willing to accept papers to review, for instance if you have some time in your schedule that week: authors could then preferentially choose you. The ability for your name in the byline of an article to link to your profile on Ontogenesis. Currently, the profiles are private and some authors have put their profiles into the article text as a temporary alternative. Add the Stats wordpress plugin. Comments do not have the author of the comment within them, e.g. pingbacks to reviews have to be clicked through to find out who wrote the review. Dealing with references/citations will be done better in future, when an appropriate plugin is found. Currently, basic HTML links to DOIs is the standard way to go. Conclusions? Be an author yourself, and try it out! This method of publishing is new, interesting, and quick. If you have a topic you’d like to write about, are interested in peer reviewing, or are just interested in reading the articles then please visit Ontogenesis and have a go, and then let us know what you think! Please note: as mentioned in the main text, I am one of the authors of articles and peer reviews in Ontogenesis. Bonetta (2009) gave an excellent introduction to the micro-blogging service Twitter and its uses and limitations for scientific communication. We believe that other social networking tools merit a similar introduction, especially those that provide more effective filtering of scientifically relevant information than Twitter. We find that FriendFeed (already mentioned in the first online comment on the article, by Jo Badge) shares all of the features of Twitter but few of its limitations and provides many additional features valuable for scientists. Bonetta quotes Jonathan Weissman, a Howard Hughes Medical Institute investigator at the University of California, San Francisco: “I could see something similar to Twitter might be useful as a way for a group of scientists to share information. To ask questions like ‘Does anyone have a good antibody?’ ‘How much does everyone pay for oligos?’ ‘Does anyone have experience with this technique? '” It is precisely for such and many more purposes that scientists use FriendFeed, which allows the collection of many kinds of contributions, not just short text messages. Also in contrast to Twitter, comments to each contribution are archived in that context (and without a time limit), providing a solid base for fruitful, threaded discussions. In your user profile, you can choose to aggregate any number of individual RSS or Atom ‘feeds‘, including scientific publications you bookmark in your online reference manager (e.g. CiteULike or Connotea), your blog entries, social bookmarks (Google Reader, del.icio.us, etc. ), and Tweets; and any other items you wish to post directly to your feed. You then look for other users whose profile is relevant to your work and subscribe to them. Every individual item posted in your subscriptions will then appear on your personalized FriendFeed homepage, plus optionally a configurable subset of the feeds you subscribed to. You can choose to bookmark (‘like‘) any of these items (Facebook copied this ‘like’ functionality just before it bought FriendFeed), comment on them, and share discussion threads in various ways. At first, this aggregation of information and threaded discussions might seem daunting. However, the stream of information can be channeled by organizing it into separate sub-channels (‘lists’; similar to but more versatile than ‘folders’ in email), according to your personal preferences (e.g. one for search alerts). In addition to individual users, you can also subscribe to ‘rooms‘ that revolve around particular topics. For example, the “The Life Scientists” room currently has 1,267 members and imports one feed. The feature that makes FriendFeed truly useful is its social filtering system. Active discussions move to the top of your FriendFeed homepage with each new addition, which automatically brings them to the attention of you and everyone else who reads those feeds. In a sense, the most current and the most popular entries compete for attention at the top, making notifications unnecessary. This means that your choice of both rooms and subscriptions affects and filters the content you see. In that way, for instance, you could set your preferences such that you would only see papers with a certain minimum number of ‘likes’ among your colleagues. Alternatively, you can opt to hide items with zero likes or comments, ensuring that only those that someone found interesting will reach you. Thanks to a very fine-grained search functionality, threads also remain easily retrievable. Some of the synergistic effects of the many scientists interacting on FriendFeed are already apparent at this early stage of adoption. 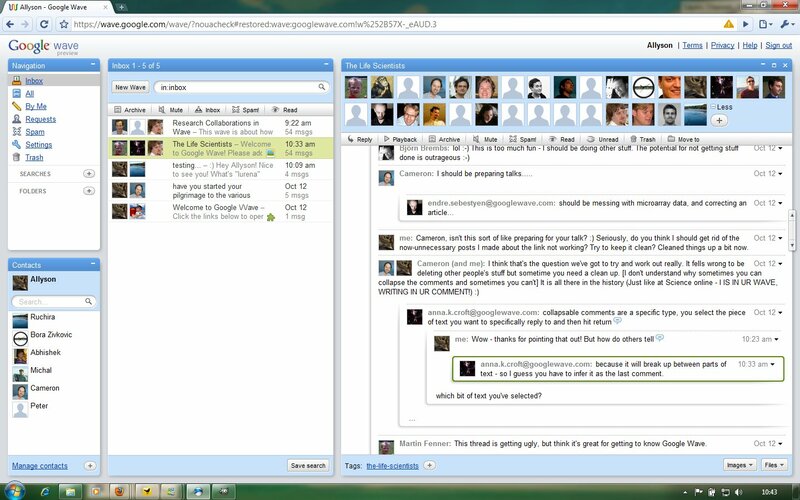 FriendFeed provides a convenient way to microblog from conferences by means of dedicated threads or discussion rooms created for the event, thus allowing to share comments within and across sessions, or even with people not physically present at the meeting. Such conference coverage has even received direct (e.g. ISMB09 , BioSysBio09 ) or indirect (e.g. ISMB08 ) support from the conference organizers. Above and beyond conference coverage, scientists use FriendFeed to share papers, experiences on laboratory equipment, resources for teaching, or anything else commonly asked at mailing lists. A number of real-world scientific collaborations have already been sparked from such interactions. Collaborative grant proposals have been initiated, submitted and some of them approved after the idea was passed around and discussed on FriendFeed. Several bioinformatics problems have been solved by code-sharing and advice. Articles in scientific journals have been published by FriendFeed users after meeting and discussing on the platform [1-5]. Of course, since FriendFeed was not designed for scientists, there is room for improvement in terms of usability for scientific purposes. For instance, files can only be uploaded upon starting a thread, not while commenting on it, and there is currently no functionality which infers a measure of reputation to a user from his/her contributions (though the wide-spread use of real names somewhat allows that to be imported). As with all online contributions, citability and long-term archiving are unresolved issues, as is the permanence of services whose source code is not public. Fortunately, the development of social networks tailored to the needs of scientists is actively being pursued from various angles. The Polymath projects , in which researchers collaborate online to solve mathematical problems, provide a number of examples. The recent award of two NIH grants of over $US10M each for exactly such purposes is another. Ultimately, the continued enthusiastic adoption of the sophisticated variants of social filtering tools by a broad community of researchers interested in sharing their science will only increase the usefulness for and thus the capabilities of the online scientific community. Acknowledgment: This comment has received input from a number of FriendFeed users, as detailed in this thread, and was jointly blogged today by Björn Brembs (FriendFeed; blog post), Allyson Lister (FriendFeed; this blog post) and Daniel Mietchen (FriendFeed; blog post). I live blogged Cameron Neylon‘s talk today at Newcastle University, and I did it in a Wave. There were a few pluses, and a number of minuses. Still, it’s early days yet and I’m willing to take a few hits and see if things get better (perhaps by trying to write my own robots, who knows?). In effect, today was just an exercise, and what I wrote in the Wave could have equally well been written directly in this blog. Pluses: The Wave was easy to write in, and easy to create. It was a very similar experience to my normal WordPress blogging experience. Minuses: I wanted to make the Wave public from the start, but have yet to succeed in this. Adding public@a.googlewave.com or public@a.gwave.com just didn’t work: nothing I tried was effective. Also, the copying and pasting simply failed to work when copying the content of the Wave from Iron into my WordPress post in Firefox: while I could copy into other windows and editors, I simply couldn’t copy into WordPress. When I logged into Wave via Firefox, the copy-and-paste worked, but automatically included the highlighting that occurred due to my selecting the text, and then I couldn’t un-highlight the wave! What follows is a very colorful copy of my notes. I’ve removed the highlighting now, to make it more readable. Unfortunately, it seems this Wavr plugin is not available via the wordpress.com setup. So, I’ll just post the content of the Wave below, so you can all read about Cameron Neylon’s fantastic presentation today, even if my first experiment in Wave wasn’t quite what I expected. Use the Wave id above to add this Wave to your inbox, if you’d like to discuss his presentation or fix any mistakes of mine. It should be public, but I’m having some issues with that, too! Cameron Neylon’s talk on Capturing Process and Science Online. Newcastle University, 15 October 2009. Please note that all the mistakes are mine, and no-one else’s. I’m happy to fix anything people spot! We’re either on top of a dam about to burst, or under it about to get flooded. He showed a graph of data entering GenBank. Interestingly, the graph is no longer exponential, and this is because most of the sequence data isn’t goinginto GenBank, but is being put elsehwere. The human scientist does not scale. But the web does scale! The scientist needs help with their data, with their analysis etc. They’ll go to a computer scientist to help them out. The CS person gives them a load of technological mumbo jumbo that they are suspicious of. What they need is someone to interpolate the computer stuff and the biologist. They may try an ontologist, however, that also isn’t always too productive: the message they’re getting is that they’re being told how to do stuff, which doesn’t go down very well. People are shouting, but not communicating. This is because all the people might want different things (scientists want to record what’s happening in the lab, the ontologist wants to ensure that communication works, and the CS person wants to be able to take the data and do cool stuff with it). Scientists are worried that other people might want to use their work. Let’s just assume they think that sharing data is exciting. Science wants to capture first and communicate second, ontologists want to communicate, and CS wants to process. There are lots of ways to publish on the web, in an appropriate way. However, useful sharing is harder than publishing. We need the agreed structure to do the communication, because machines need structure. However, that’s not the way humans work: humans tell stories. We’ve created a disconnect between these two things. The journal article is the story, but isn’t necessarily providing access to all the science. So, we need to capture research objects, publish those objects, and capture the structure through the storytelling. Use the MyTea project as a example/story: a fully semantic (RDF-backed) laboratory record for synthetic chemistry. This is a structured discipline which has very consistent workflows. This system was tablet-based. It is effective and is still being used. However, what it didn’t work for was molecular biology / bioengineering etc — a much wider range of things than just chemistry. So Cameron and others got some money to modify the system: take MyTea (highly structured and specific system) and extend it into molecular biology. Could they make it more general, more unstructured? One thing that immediately stands out for unstructured/flexible is blogs. So, they thought that they could make a blog into a lab notebook. Blogs already have time stamps and authors, but there isn’t much revision history therefore that got built into the new system. However, was this unstructured system a recipe for disaster? Well, yes it is — to start with. What warrants a post, for example? Should a day be one post? An experiment? There was little in the way of context or links. People who also kept a physical lab book ended up having huge lists of lab book references. So, even though there was a decent amount of good things (google indexing etc) it was still too messy. However, as more information was added, help came from an unexpected source: post metadata. They found that pull-down menus for templates were being populated by the titles of the posts. They used the metadata from the posts and used that to generate the pull-down menu. In the act of choosing that post, a link is created from that post to the new page made by the template. The templates depend on the metadata, and because the templates are labor saving, users will put in metadata! Templates feed on metadata, which feed the templates, and so on: a reinforcing system. An ontology was “self-assembled” out of this research work and the metadata used for the templates. Their terms were compared to the Sequence Ontology and found some exact matches and some places where they identified some possible errors in the sequence ontology (e.g. conflation of purpose into one term). They’re capturing first, and then the structure gets added afterwards. They can then map their process and ontologies onto agreed vocabularies for the purpose of a particular story. They do this because we want to communicate to other communities and researchers that are interested in their work. So, you need tools to do this. Luckily, there are tools available that exploit structure where it already exists (like they’ve done in their templates, aka workflows). You can imagine instruments as bloggers (take the human out of the loop). However, we also need tools to tell stories: to wire up the research objects into particular stories / journal articles. This allows people who are telling different stories to connect to the same objects. You could aggregate a set of web objects into one feed, and link them together with specific predicates such as vocabs, relationships, etc. This isn’t very narrative, though. So, we need tools that interact with people while they’re doing things – hence Google Wave. An example is Igor, the Google Wave citation robot. You’re having a “conversation” with this Robot: it’s offering you links, choices, etc while having it look and feel like you’re writing a document. Also is the ChemSpider Robot, written by Cameron. Here, you can create linked data without knowing you’ve done it. The Robots will automatically link your story to the research objects behind it. Robots can work off of each other, even if they aren’t intended to work together. Example: Janey-robot plus Graphy. If you pull the result from a series of robots into a new Wave, the entire provenance from the original wave is retained, and is retained over time. Workflows, data, or workflows+data can be shared. Where does this take us? Let’s say we type “the new rt-pcr sample”. The system could check for previous rt-pcr samples, and choose the most recent one to link to in the text (after asking them if they’re sure). As a result of typing this (and agreeing with the robot), another robot will talk to a MIBBI standard to get the required minimum information checklist and create a table based on that checklist. And always, adding links as you type. Capture the structure – it’s coming from the knowledge that you’re talking about a rt-pcr reaction. This is easier than writing out by hand. As you get a primer, you drop it into your database of primers (which is also a Wave), and then it can be automatically linked in your text. Allows you to tell a structured story. We’re not getting any smarter. Experimentalists need help, and many recognize this and are hoping to use these new technologies. To provide help, we need structure so machines can understand things. However, we need to recognize and leverage the fact that humans tell stories. We need to have structure, but we need to use that structure in a narrative. Try to remember that capturing and communication are two different things. I got a Google Wave account (grin) via Cameron Neylon on Monday morning (thanks, Cameron!). I’m trying not to get caught up in all the hype, but I can’t help grinning when I’m using it, even though I don’t really know what I’m doing, and even after seeing the Science Online Demo and a couple Google videos. But where and how will we get the benefit of the Wave? I’ve read a few articles, and played around a little, and chatted with people, but I’m still a complete novice. So, I’m not going to talk about technical aspects of waving here. However, even now I can see that the power of Wave will not be in what’s available by default (as was the case with Gmail – you got an account, started using it, and that was pretty much it). It will be in the new applications, interfaces and most especially the Robots that will be riding the Wave with us where the most value will be. OK, so I’ve only had an account for one day, but I think even as a beginner, I can see it is in what we will create for ourselves and our communities to use that will make or break this new thing. And, as ‘we‘ are so much a requirement for this to work, my next point becomes pretty important. What it will really take to get the best out of Wave for us researchers and scientists? It will take many, many scientists participating. Social networking needs to get a lot more important to people who currently may just make use of e-mail and web browsing. This is exciting, but we’ll need their help. A very good slideshow by Sacha Chua about this can be found on Slideshare. Use it to convince your friends! As for me, I’ll be waving with both hands this Thursday at 2pm, when Cameron Neylon comes to talk about open science, Google Wave, and more. Unless Cameron is a fantastic multitasker, I may be the only one with an account at the presentation. Not sure how interesting it will be if I am the only one waving. I’ll keep you updated, and post my experience with live blogging with Wave here, and let you know how it goes. I’m also hoping that I can get some of my research out there into the wider world via Wave robots. I have an interest in structured information (ontologies, data standards etc) and think this may lead to some interesting things. So, the sound of two hands waving? Pretty quiet, I think. But add another few hundred pairs of hands, and things may get a lot louder. First off, I’d like to thank the many people who re-tweeted my blog posts throughout Science Online London this past Saturday. With your help, Saturday was my best day ever for visits to the site. I hope people enjoyed my posts, and perhaps stayed long enough to find out what I blog about when I’m not at conferences (those I’m most proud of include a day I spent at a primary school last year, and a co-authored post with Frank Gibson on attribution versus citation). Those solo09 posts I wrote on Saturday were intended mainly as notes, as a transcript of what went on. It helps me concentrate to take notes, and due to my fabulous parents talking me into taking typing classes in high school, I am able to (mostly) keep up with presentations! But I wasn’t the only one blogging, and many people since Saturday have been writing up and posting their thoughts: Martin Fenner has been keeping track of what seem to be all blog posts about solo09, so please visit his post to find out what everyone thought of the day. My blog posts on the day were a record of the day’s presentations, from my point of view. Today’s post is more personal – it was my first time at a Science Online conference, and this is a record of my impressions. A book in one of the libraries at the Royal Institute. 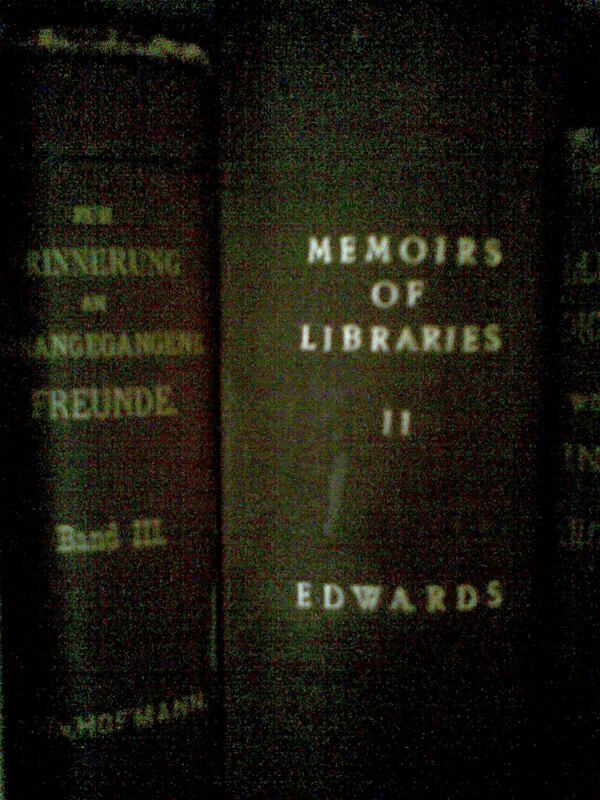 Memoirs of Libraries, in a library! Then I wandered upstairs and had a look at the Faraday Theatre, with its surprisingly uncomfortable seating but beautiful fittings and fantastic ambience. Just a tip though – watch out for the Ambulatory Displays up there on the first floor. 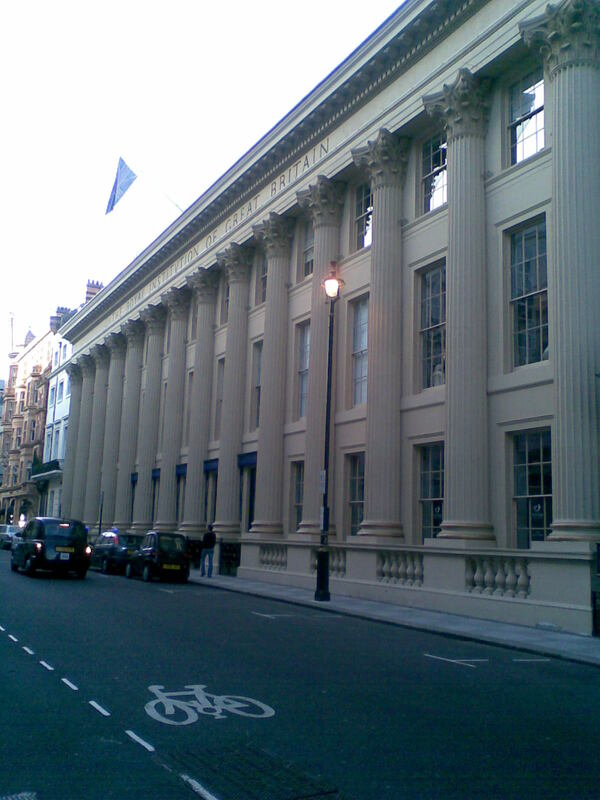 The British Library had a table set up in a prime position opposite the Faraday Theatre, and at that table I met some BL people as well as Stewart Wills, an Editor for Science. I had never spoken with a Science editor before, and I had a really enjoyable conversation with him and the BL people about wildflowers and ontologies for 20 minutes or so, until it was time for the conference to start. I won’t go heavily into the presentations, as I have already covered them. Suffice to say I thought they were all very interesting, often entertaining, and definitely educational. While I would have loved to have much more time for open discussion at the end of each presentation, that didn’t spoil my enjoyment. I had my first experience with Second Life, and watching the odd behaviors of the avatars in it was almost hypnotic. One seemed to be playing the spoons or typing on an invisible keyboard or something. Many others seemed to be hanging off an invisible wire in their back, and others flounced, tilted alarmingly, or even looked attentive. I will choose a favorite presentation though: I loved the theatrics and the content of John Gilbey. He presented a number of speculations about the far future, and said that we could all vote for our favorite by emailing him in the next week. Then, he’ll do his best to write about it in the context of the University of Rural England and get it into print 🙂 Fun! You can email him at gilbey@bcs.org.uk. I had a number of good conversations with Sara Fletcher of Diamond Light Source about power cables, last year’s Science Online, and meeting people in the real world who you’ve gotten to know only through the (unreal?) world of the Internet. We were the ones sitting near the annoying ringing iPhone during the metrics/statistics talk by Richard Grant and others. No, it was NOT our phone, and yes, we tried to find it to turn it off but were unsuccessful. It was great seeing bloggers made flesh: Petra Boynton, Jack of Kent, Cameron Neylon and Peter Murray-Rust were just a few of the people I either listened to or spoke with for the first time. Peter, Phil Lord and I had a great conversation about ontologies OWL ontologies – well, about semantics. I left London that evening, this time on a full train of tired people wanting to get home that was in stark contrast to the quiet, empty train and the beautiful sunrise that began the day. I had a great experience and my thanks goes out to all the organizers and people who helped make Science Online London work. I am now more interested in Google Wave, still want a single unifying identifier for me and my online personas (one identifier per persona, or one per person?) and am more aware of the legal implications of blogging. I feel like I’ve increased not just my knowledge of all things science and online, but also the size of my online science community, which is a community that has enriched my research environment and work life more in the past year than I ever thought possible. The Life Scientists, Science 2.0, Twitter and my good friend Google Reader keep me in touch with all of the other blogs of science of friends and colleagues, and I’m following many more after Science Online. I am a better scientist and researcher because of my connections to this community – Thank you all!